Not too long ago, Connecticut had a limited selection of Asian restaurants to choose from other than Chinese and Indian. Even hibachi-style restaurants are a recent phenomenon. Within the past ten years, there have been an explosion of Thai, Vietnamese, Japanese and Korean restaurants on the dining scene. Fusion restaurants have started to gain popularity as well. When Lotus Grill opened in 2009, it was the first of its kind in the Farmington area. In the years since, Lotus Grill gained significant popularity for this reason. We decided to see what the hubbub was about. Atmosphere: 8.5/10-Lotus Grill embodies the definition of a hole in the wall. When we stepped inside, we noticed how small the interior was for customers to dine in. While the restaurant is largely a take-out one one, we prefer to eat there being from separate towns. We were charmed by the layout but felt a bit compacted. Service: 9/10- While there are only a couple of employees on duty, the staff prepares the orders for take out and dining in in a timely fashion. We received our meals within 10-15 minutes of ordering on a busy Saturday night. The customers we saw picking up their food did not have to wait long at all for theirs. They also supply you with chopsticks without asking. At many Asian restaurants in Connecticut, a customer often receives chopsticks upon request only. This deviation from the norm speaks to the Lotus Grill’s authenticity. Price/Selection: 9/10-Lotus Grill offers a wide variety of Vietnamese cuisine. While they are best known for their pho, they also serve spring rolls, sate, dumplings, crepes, vermicelli, lotus curry and various vegetarian dishes among other options The first time we visited Lotus Grill, we had trouble deciding what to try. The prices are more than reasonable, considering that the most expensive option on the menu is $14.99. Most of the Pho dishes cost around $8 or $9. Taste: 8.5/10-For our appetizers, we particularly enjoyed the sate, which is a grilled meat on a skewer, and the summer rolls. They had plenty of flavor on their own and didn’t require any additives. We found their fried rice dishes, especially the pork and chicken ones, to be the most delicious and filling because of their massive portions and inclusion of egg, onion, peas and carrots. The pho, though tasty, left a bit to be desired. 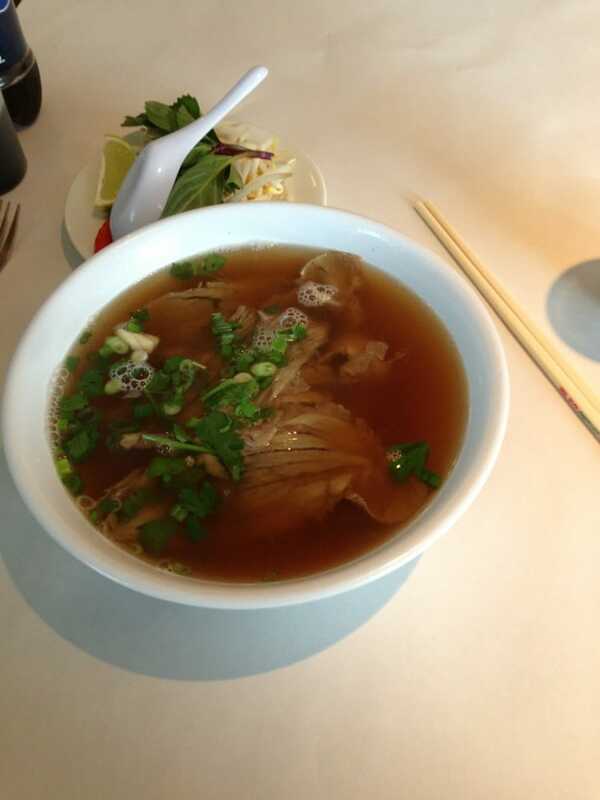 We received only a few pieces of beef in our rare and cooked beef rice noodle soups. In a nutshell-35/40-Lotus Grill is a unique offering in the central Connecticut area. As a hole in the wall restaurant, it is quaint but could expand so that more customers from out of town could dine in. If you have never tried Vietnamese cuisine before, we recommend trying them because of the variety and authenticity of their dishes.